← September Meeting Coming Up! Lisette Kielson, New Music Director For 2013-2014! We have exciting news about our upcoming season: the board of the Chicago Chapter is thrilled to announce that Lisette Kielson has been hired as Music Director! Most of you know Lisette. She has regularly challenged us as a cheerful and energetic (to say nothing of skilled) instructor at Whitewater, and she directed our Chicago Chapter recorder workshop in 2009. Lisette has performed to acclaim as soloist, chamber musician, and orchestral player in France, New York, Chicago, and throughout the Midwest. Her recordings are played nationally and have been reviewed in American Record Guide as well as in other print and online media. She holds Bachelor’s and Master’s Degrees in flute performance from Indiana University and a post-master’s Diploma in recorder performance from The Royal Conservatory of The Hague, The Netherlands. Lisette is the Artistic Director of L’Ensemble Portique, directs the Collegium Musicum at Bradley University, serves as Associate Director of the Recorder Orchestra of the Midwest, and teaches at workshops and festivals throughout the country. 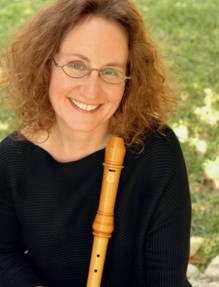 President of the American Recorder Society from 2008-2012, Lisette is currently serving the last year of her second term on the ARS Board of Directors. Lisette brings her expertise and enthusiasm to the Chicago Chapter this year with great ideas on how to make the Chicago Chapter a vital and growing community of musicians. Her vision includes welcoming beginners, enhancing marketing & outreach, and expanding Chapter performance goals. Our meetings will continue at Covenant Presbyterian Church in Bucktown from 2 to 5 PM on the third Sunday of each month, September 15, October 20, November 17, December 15, January 19, February 16, March 16, April 20 (the April date might change to April 13), and May 18. The season will end with a Chicago Chapter performance at the annual event Make Music Chicago on June 21, 2014!